Thursday, 24 January 2019, 11:05a.m. 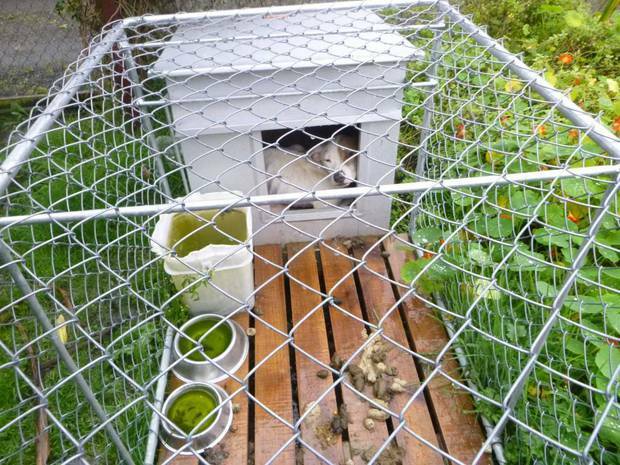 A Tauranga man has been jailed for four and a half months for neglecting his two dogs. Louis Delves pleaded guilty to four charges under the Animal Welfare Act 1999 relating to failing to ensure the physical, health and behavioural needs of his two dogs Tank and Sass were met. The Society for the Prevention of Cruelty to Animals (SPCA) said the case is believed to be the most significant jail sentence for mistreating animals since a Gisborne man was jailed for nine months for bashing his dog in the head in 2016. "SPCA prosecutions don't result in a jail sentence very often," said communications manager Jessie Gilchrist. Tank and Sass had both lost 40 per cent of their body weight and were infected with intestinal worms and fleas when an SPCA inspector visited Delves' property in Whanganui in June 2017. "Tank was chained to a carport post and was cowering, totally exposed to the torrential rain," the SPCA said. "Sass was curled up shivering inside a kennel and run." The dogs were emaciated. They had a body condition score of just 1 out of 9. Tank was anaemic, likely due to parasite-related blood loss and nutritional deficiencies causing impaired red blood cell regenerating capacity. Sass' blood tests revealed low creatinine, likely a result of malnutrition and low muscle mass, and she had dirty wounds on her ears. "In SPCA's care, both dogs flourished," the organisation said. "After just one month Tank gained 10.5kg and Sass gained 9.5kg. Both have been adopted to new loving families and are happy and healthy." Delves was sentenced in the Tauranga District Court yesterday to four months and two weeks' imprisonment, and was ordered to pay reparations of $455.78 and $250 contribution towards legal costs. He was also disqualified from owning or exercising authority of dogs for three years. SPCA chief executive Andrea Midgen reminded all animal owners that they have a "legal responsibility to ensure the physical, health and behaviour needs of your pet are being met". "Sadly, this situation of significant neglect is something we see far too often," she said. "Tank and Sass were completely reliant on their owner for food and veterinary treatment. Not only did he fail to provide them the food they needed, but he left them chained and alone in the backyard, unable to move or attempt to find food themselves. These dogs were highly vulnerable. "The serious neglect of Tank and Sass is completely unacceptable."